Ergonomics is an area that office and facilities managers are becoming increasingly aware of. If staff are suffering from knee, leg or ankle pain in the office, there could be a simple solution to their posture-related ailments: foot rests. Our range of modern foot rests have been ergonomically designed to support your legs from the feet up, thereby relieving the strain from your thighs. Whilst sitting for long periods is not ideal, sometimes it cannot be avoided. The more comfortable one is for sustained periods of sitting at the desk, the better for health and wellbeing, as well as having a positive effect on concentration and productivity levels - something our range of foot rests can significantly help with. 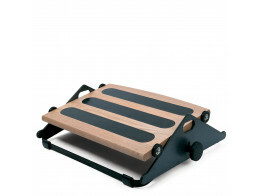 Our Humanscale foot rests boast a variety of features and benefits. For example, the FM300 Foot Machine and FM300B, with ball bearing rollers, encourages movement by way of the gentle rocking of your feet. This engages the lower leg muscles and consequently stimulates circulation. With massage balls to rejuvenate tired feet and 3” height adjustment for customised positioning, posture is optimised. The FM500 Foot Rocker eases pressure on the lower back when sitting by offering optimal support for the feet and legs. 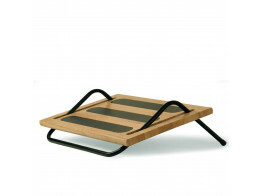 With curved supports FM500 foot rests encourage gentle rocking and offers an ergonomic design. FM100 Tilting Foot Rests offer a stable yet dynamically adjustable square foot rest support and a cost-effective Humanscale foot machine. The specially designed non-skid surface provides a reliable contact point for the foot, alleviating pressure from the lumbar region. An office footrest benefits employees by providing an ergonomically designed solution to avoidable aches and pains. Being sympathetic to human factors in the office and investing in footrests will likely yield long term rewards. FM300B foot machine offers built-in massage balls to rejuvenate tired feet and stimulate blood flow. FM500 Foot Rocker eases lower back pressure when sitting by providing support for legs and feet. 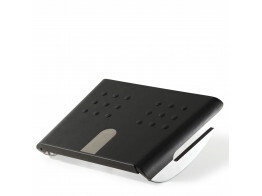 FM100 Tilting Foot Rest offers stable yet dynamically adjustable foot support at your desk.